There are many places to draw inspiration in life. One of them for me is my big sister. Like me, she took the plunge of leaving a life with a regular pay check behind to follow her dreams. Quitting her job as a lawyer in London, she decided to make a career out of one of her biggest passions – film photography. It has been amazing over the last few years to see the stunning images she has captured, and to see her become more established in the industry. I’m just getting into the world of making mini videos. The one I made from my time on music cruise Cayamo was done on iMovie (http://youtu.be/RE7Z5AVFbxU) and I’ve also heard of a program called “Vine” that takes 3 seconds video clips that can be edited into something cool. I’m looking forward to doing some more experimenting! If anyone has any other cool programs you like to use for this kind of thing, I’d love to hear about them! 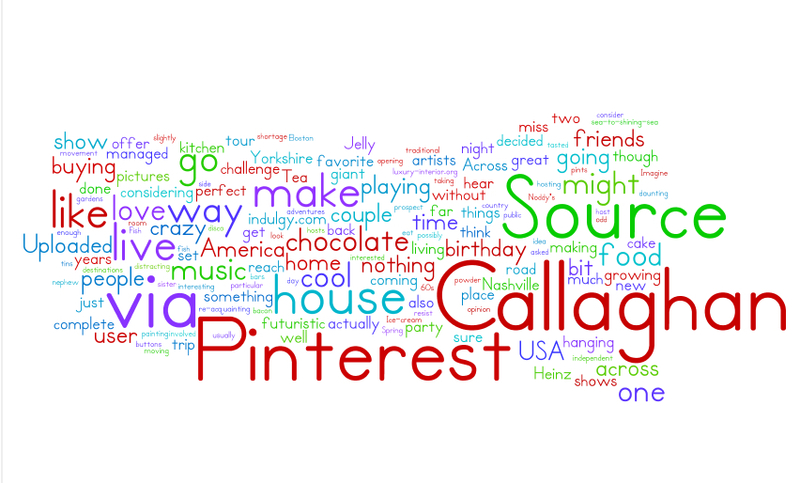 Create your own blog word cloud! I recently came across a cool little website called http://www.wordle.net that makes word clouds from your website or any text you want to use. 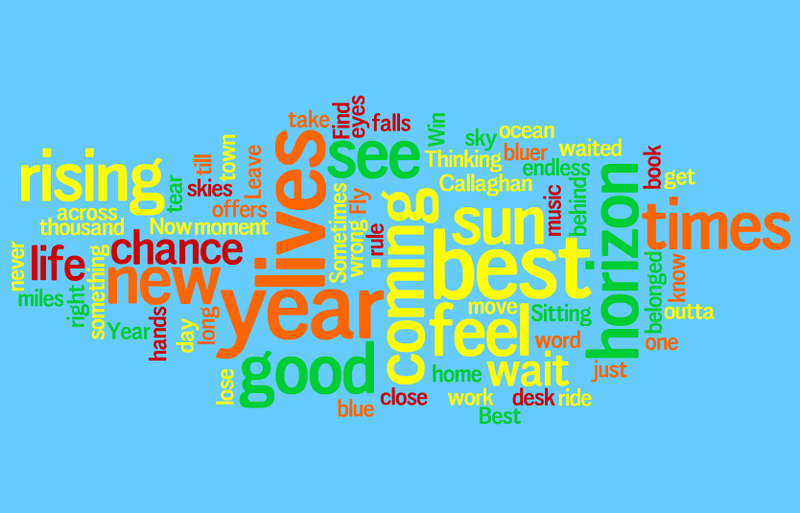 I thought i’d try out my blog to see what came out, which words appear most often and how arty you can make it look! It’s a fun way to pass a few minutes on a Friday afternoon! Here’s another one that I made for one of my songs “Best Year”….You can download the song for free from http://www.noisetrade.com/callaghan and see if the picture below fits the mood of the song! Top Ten Christmas Gift Ideas For The Person Who Has Everything…Including More Money Than Sense! When the colorful lights decorate homes and city streets, store fronts are invitingly decked out with festive cheer, the cold nights draw in tempting you to indulge in some guilt free consumption of comfort food and warming alcohol, and for some reason, it’s the time of year when people start buying the craziest of things. People who may have been, for the previous 11 months, totally normal now make it their mission to find and purchase items for friends, family members and co-workers, spending their hard earned dollars or pounds on useless and unwanted gifts that will be relocated to a basement, utility room or dusty drawer come December 26th. Don’t get me wrong, I’m not a scrooge. In fact, I am one of the biggest suckers out there for anything that seems vaguely Christmassy – my tree goes up in November! But what happened to “it’s the thought that counts”? It seems that nowadays the stores bombard us with so many items and pressure to buy that any gift is better than no gift at all, despite the fact that we probably all reached the point of not really needing anything a long time ago. For only $14.95 you can take the fun completely out of snowball fights with this useful gadget. No more frozen hands preparing your icy weapons, this handy kit also shaves valuable hours off constructing the snow blocks for your Christmas ice house. I’m currently splitting my time between Nashville and Atlanta so this would be really good for all those snowy days! Christmas is a time for catching up with family, friends and loved ones. Don’t let it also be a time for catching germs. This battery-powered sanitizer is a carefree way of erasing the memory of the unimaginably unsanitary places your cell phone and bluetooth devices have been in the last 11 months. Want to give a gift of royal quality? Look no further than this genuine HRH Queen Elizabeth-approved plastic umbrella. Featuring “easy opening and closing, and black regal trim”, this gift will bring a touch of class to your festivities this year. It’s not quite as good as Mary Poppins’ umbrella which allows you to fly, but those are out of stock! Who needs fancy stereo sound systems, or expensive firework extravaganzas, when all your party is waiting for is this state of the art music player. Your guests will be high on party atmosphere as they experience the “dazzling light show”, and measuring in at “no larger than a box of tissues” you know you’re going to get the sound quality your Christmas event deserves. No one gets left out at this party – The Light Show Music Player comes fully equipped with a remote control so you can DJ from the dance floor. Or just switch to the built in AM/FM function and let someone else do the work while you dance the night away. The Holidays can be such a stressful time – people visiting day and night, and a huge pressure to be the perfect host. The Hands Free Wine Aerator takes the hassle out of entertaining for the host that wants to get hammered with their guests while still enjoying the subtle bouquet of aerated wine. No longer will you have to worry about being sober enough to hold your favorite bottle of wine vertically upright, this hands free decanter does all the work, leaving you more time for what’s really important at Christmas – drinking yourself horizontal. Ever feel weighed down by excess bills in your wallet or get that bloated feeling in your bank account? Get instant relief and feel $129.95 lighter when you purchase the iPhone Controlled Ball Dropping Bomber. This christmas you can drop ball bombs on your nearest and dearest. In this digital age everyone agrees that those magical moments are best viewed on a 3 x 2 inch screen. But don’t stop at photos taken with your iPhone only – this Direct To iPhone/iPod Scanner allows you to take any picture and scan it into your phone, cleverly reducing the size and quality of the photo. And how about all those recipes you’ve been collecting that are piling up, or the unmanageable number of business cards we all have to organize? Now those too can easily take care of all your iPhone’s spare storage. In fact, you can scan anything so long as it’s no bigger than 4×6. This handy extra-bag-required-sized accessory is the perfect gift for the person in your life who loves those “impromptu scanning sessions” and let’s face it, it’s not a party till you scan something! Surprise someone you love this Christmas with the gadget all home-makers have been waiting for. No longer will you have to drag around the heavy and bulky plastic container of filth collected from your home, you can strap all the dirt, grime, toe nail clippings etc onto your back! Why rely on the wheels of a regular vacuum cleaner when your own back can take the strain? Learning a new language can be overly time consuming. The modern global jet-setter simply doesn’t have time to be rifling through phrase books every time they’re in a new country. Now you don’t have to with The Talking 30 Language Translator. Unlike its $3.99 iPhone app competitors, which unhelpfully also translate photographed words, this sleek 1985-styled device can be the envy of your fellow travelers for only $249.95. No home is complete without some Christmas decoration, and what could be more impressive than this tasteful Two Story Inflatable Reindeer? For under $400 you can make your home the talk of the street. Or surprise the recipient of this gift, and let their holiday guests enjoy literally seconds of amusement. Make your cat feel loved this year by buying its own outdoor heated shelter. Even better than allowing ‘Fluffy’ indoors on a cold wintry day, the Outdoor Heated Cat Shelter gives your cat a feeling of independence whilst protecting it in all weather conditions. If you enjoyed reading about these Top 10 Christmas Gift Items and would like to know where you can buy any of them from, it might be time to have a long hard think about things! I hope you and yours have a happy, fun and wonderful Christmas! It felt good being back in Atlanta again. After so much time on the road and recently spent writing in Nashville I love the opportunity to get back to the city that has become my first American home. A chance to drive down familiar roads, catch up with friends, and to start rehearsals for my show at The Red Clay Theatre just north of the city, in Duluth. This was the first week of band rehearsals but preparations for the show had been going on a lot longer. For this show I wanted to push the boundaries and really see what is achievable despite being an independent artist on an independent-sized budget. I wanted the audience to feel like they had seen a big show in the intimate setting of a 250-seat theatre. I was venturing into areas that I had never been before – designing a lighting plan, timing the set to know how much space was left in between each song, costume changes, as well as recording and filming the whole night. Luckily I had help. Lots of help from people who I cannot thank enough, and who worked so hard putting the show together with me. I now understand why those arena shows have hundreds of people on the team! The day of the show went by in a blur. It reminded me a bit of how on your wedding day people tell you to take a step back and enjoy the moment. There was so much going on that it was a challenge taking it all in. 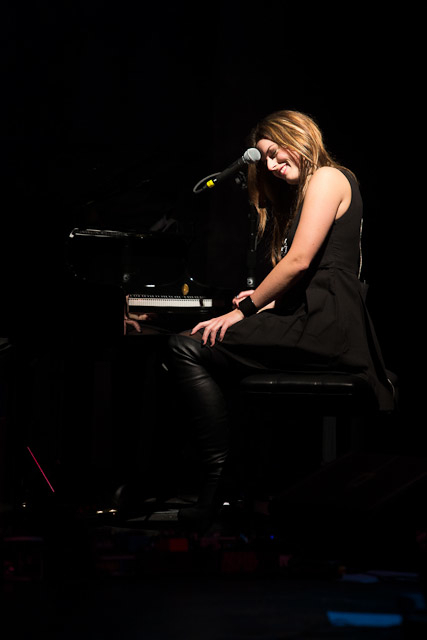 Because of extra time needed sound-checking for the actual show and for the recording, as well as a few issues with positioning the new grand piano and a guitar breaking, I was still on stage at 6pm, only an hour before the doors were opening. And I still had to film backstage interviews, get dressed, go through vocal warm ups, and eat some dinner! This is so often the scene before a show though, and there was so much riding on this particular one it was hard to relax. Somehow it all got done, and I was there right on time to walk onto the stage for the first song – a cover of Johnny Cash’s “Walk The Line”. I’m still working out which songs will be on the final live CD which I hope to have available by the end of the year. A good idea for some Christmas presents! I’ll be putting up some live footage soon on my Website and Facebook page, as well as some photos from the show. I can honestly say I learnt more from this show than probably all the others I’ve done combined, and maybe there are some things I’d change next time, but that’s what performing is all about. Learning and improving. And I can’t wait for the chance to do the next one…I’m already thinking of new ways to make it even bigger! And to my wonderful band! 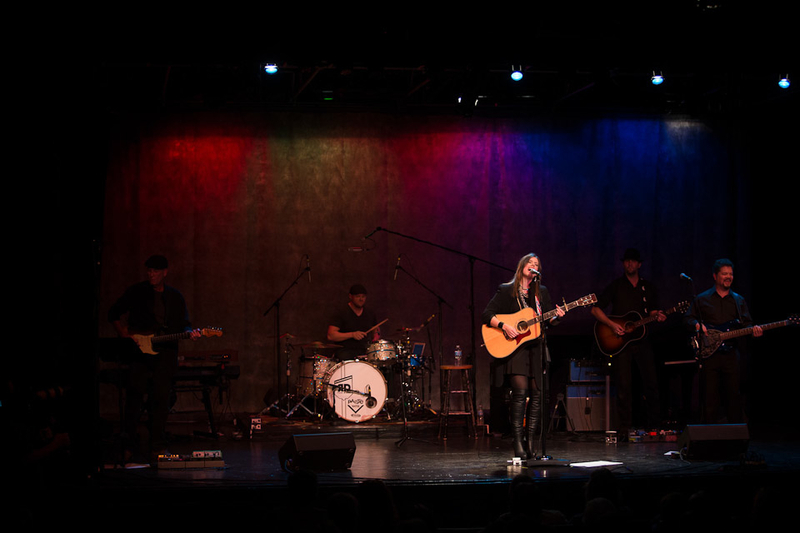 Unfortunately the joy of the weekend was followed by Hurricane Sandy – and it was shocking to see the devastation that unfolded in towns and cities where I have enjoyed playing shows and meeting people. I hope individuals and communities who have lost possessions, homes and even loved ones, will find the strength to get through a very difficult time. Lost in Cyber Space – How Many Websites Does One Musician Need??! Sometimes I imagine there was a golden age when being a musician mostly meant creating music and writing songs, going out and performing at shows, and and then going home to practice and get better. But it’s easy to look back through the rose-tinted glasses and forget that making a living from music has always required a lot of other work to support the creative side of what you are doing. And the only reason it’s 9 and not more is because I had to put a limit on it somewhere, otherwise ironically my plan to leave my desk-based job and do music full time would still leave me sat in front of a computer screen all day. But there are new sites coming along all the time to draw me in and are hailed as THE site you must be on if you want any presence on the internet, just a few suggestions include; StumbleUpon, Digg, LinkedIn, and Flickr. Once you start looking into which sites your videos should be shared on, how to get your songs on internet radio shows and podcasts, where your blog should be hosted and how to connect with other bloggers, how to make sure search engines like google and yahoo know your sites exist, and how often you should be updating all of these sites with new and interesting content, your head starts spinning until you feel you would be lucky if a short thunder storm passed through and caused a temporary power cut to shut your computer off and give your brain some temporary relief! The huge upside of all this is that there are now so many new ways for musicians to connect with their fans and to reach new people who will also hopefully become fans. I really love the ease that comes with having a Twitter and Facebook page where I can chat with the people who came to my show last night, or recently bought my CD. And it’s a great way of letting people know about a new song I’ve written, a video I’ve made or a show in their area. But what’s the cost of all this time spent communicating virtually? I was discussing it with a musician friend last night and we were wondering whether we are all forgetting what it means to connect with someone on a personal level, look them in the eyes when we talk and take the time to listen to what’s going on in each others’ lives, instead of scanning through short bursts of impersonal information posted to computer screens each day. I’ve believed for a long time that if you spend a lot of your waking hours passively engaged – whether that’s on the internet or watching TV, it’s not a good thing. It makes it a challenge to suddenly try and engage your mind and imagination, to write songs, or to take an active role in what’s really going on in the world around you. And perhaps even more sad than that, as a good friend of mine is always lamenting, the internet has killed the art of the well told joke. No one can ever remember a joke they read on an email, no matter how funny, hours later sitting in the pub with friends. 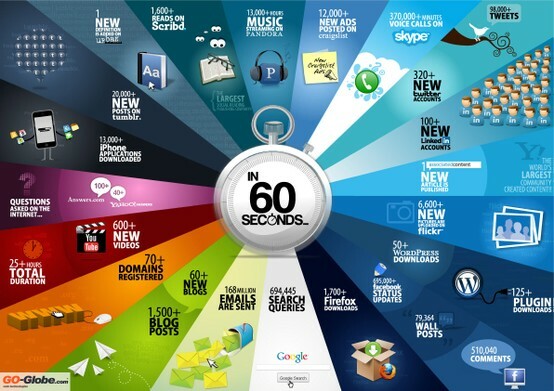 I guess like many aspects of life, there are downsides and upsides that have come with the invention of the internet. So, I’ll just have to remember not to overdose on internet time. Like the super indulgent Thomas Keller brownies I made yesterday, everything is good in moderation. Now, I’d like to ask you to not check my Twitter or Facebook page, and instead go and tell someone a joke!